Sensory stimulation with familiar scents. A metre of calico fabric of a natural colour. Ground coffee, cinnamon stick or powder, dried lavender and rose petals. Rubber bands and colourful ribbons. Cut 4 pieces of calico 20cm long by 15cm wide. Sew pieces on three sides to make squarish ‘pockets’ and leaving one side to insert chosen scents. Insert each one with one of the chosen scents and close opening; first with a rubber band and then with a nice colourful ribbon. Make sure residents cannot untie them. Seat residents (2 or 3 only) around a table and pass them one pocket at a time. Encourage them to remember by giving clues e.g. ‘It smells like something we sprinkle on donuts. Have you tried this activity or a variation of it? I have actually done another way with purchasing some perfumes, talcs, soaps, shaving cream etc and have the residents smell them and then we reminisce with what uses they had. So many memories came forth from Johnsons baby powder and sunlight soap...well worth a try. I had both men and women's scents. You are so creative Joanne, I love all your ideas! (And so does everyone else!). Thanks for sharing! We tried this with our residents but had an issue with a lot of the residents not being able to smell the scents. Do you have any other suggestions on what we could do? Hi Sierra, in group settings sometimes it takes more than one session for them to get into the activity. You shouldn't give up; try another time with something completely different. It requires a little planning. Think of the popular perfumes and colognes from the 1950s and 1960s: buy or borrow it from residents' relatives; all you need is 3 or 4 perfumes/colognes. 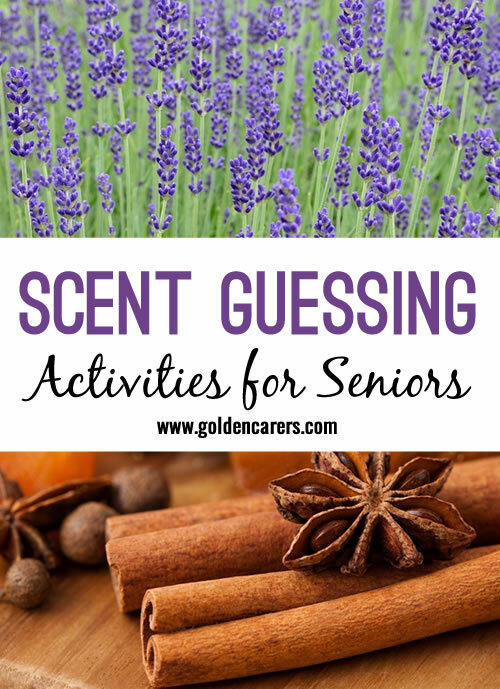 You may also ask residents what perfumes they used or preferred and then get the scents according to their taste and run the session a couple of weeks later. They will come around, you'll see! We did this activity this morning and it was well received by our residents. Our focus today was on spices- cinnamon, nutmeg, star anise and cloves. The activity provided a pleasant experience for residents and evoked happy memories of baking. It also raised giggles as those participating in the activity tried to guess the contents of the pouches from touch as well as smell. This is lovely to hear Catherine, what a great outcome! I'm always amazed at the power of different scents to trigger memories from the past. Love the strong scents you chose, spices are perfect for this activity! This is an excellent idea! I started putting lavender in the room for my friend. It helps whenever she resists taking the last dose meds before bed. I let her smell the lavender scent and it seems to make the task a little more pleasant for her. Thanks for your feedback Marilyn. I created a sensory theme afternoon, with essential oils burning, strawberry scented candles, lava lamps, salt lamps, electric lighting, soothing music, herbs to smell, salted dough and mystery bean bags to touch. I closed curtains to create an effect and atmosphere. Very well received and lots of nice comments. I love the idea of a sensory theme afternoon!! Sounds like it was a lovely activity Sally! Thanks for sharing. Great ideas folks. At Hortic therapy, we deliver gardening sessions to senior citizens and people living with Dementia. We do a similar session called Guess the scent. The residents are blind folded and they then get to feel and smell the real product or plant. They have 3 guesses, if after the third one it is not correct, they are given clues then the answer is revealed. Good fun and great reminiscent stories are relived. I have made play dough and mixed in baking flavours and colours like caramel, lavender, lemon, orange, peppermint and vanilla. They were great to make shapes from too adding a 'touch' element. I put them in separate zipper plastic bags for a 'what do they remind you of..' Reminiscence session. That's a good tip! I remember shopping for perfume one time and being offered coffee beans to smell in between different perfumes. We have found that fresh coffee grinds is generally a good scent to neutralize if some are experiencing overwhelming tones or aromas. 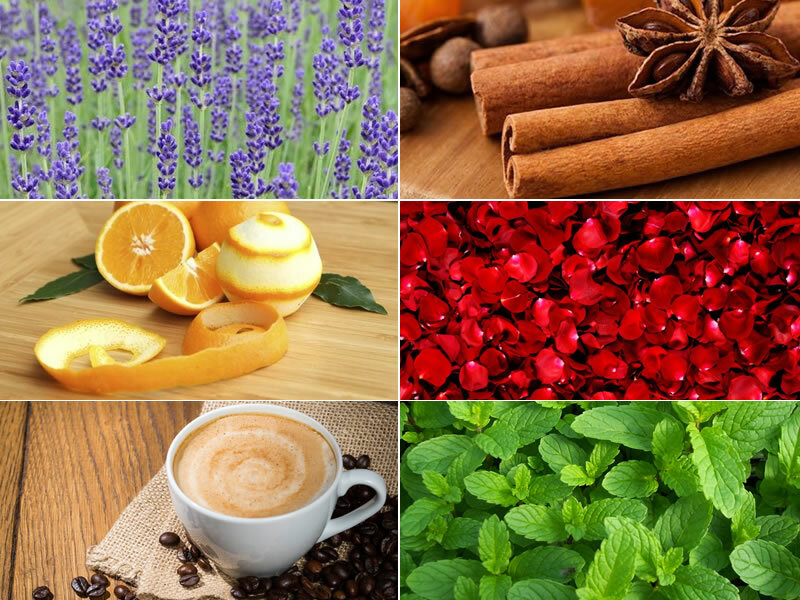 So after, let`s say smelling cinnamon, then moving on to clove, some individuals wanted to smell the coffee grinds in between each one, thus enabling them to know that the scent in between is a familiar one, that one being coffee. Great Ideas! I have the scents alone, and snippets of materials from local fabric store, also lots of ends of ribbon, even a box of buttons. I had not thought to combine to make them into a scent project. Also, we can make the scent swatches during creative crafting time! I LOVE this activity site! There are so many people out there with great ideas, and Golden Carers able to produce a website for us to share! I did one which I used in Girl Guides...you put different spices etc into the film canisters and number them...the residents then guess what you have in them..you can also use things they can taste...icing sugar, flour...it's amazing how the senses will lead into reminiscing. Hi, I did a scent memory session with Dementia residents. Old time smells such as Old Spice, Fishermans Friends, Lavendar Talc, 4711 Perfume!! It was great and got some old memories back the surface simply by smelling. Hi, we have done something similar, but we included items that the residents have to feel. Items such as cloths pegs, coins( aussie 50c is tricky) rice , pasta etc. Things that ladies in particular, may have used at home everyday. Thankyou Solange:) should be fun. That's a great idea Joanne, this would be a perfect Mother's Day activity. I really like this idea and think i will use it for a Mothers Day activity, using scents a mother would be familiar with. For example Baby oil, Cuddly, Dettol and the kitchen scents like coffee and cinnamon. With liquids like baby oil etc i would put a few drops onto cotton wool and insert that into the pouches.